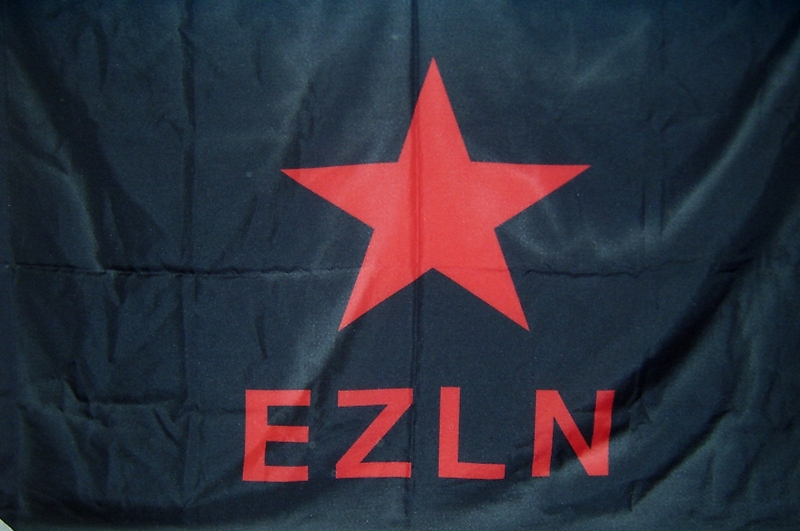 Statement by the CNI, CIG, and EZLN about the NAIM (New International Airport of Mexico) and about people that were forced to move from their Central American territories. Originally published by Enlace Zapatista. The peoples, nations, tribes, and barrios of the National Indigenous Congress (CNI) and the Zapatista Army for National Liberation (EZLN) respectfully address the Mexican people and the originary peoples and campesinos who wage dignified resistance against the death-driven megaproject called the New International Airport of Mexico (NAIM). These peoples have sustained hope without giving up, giving in, or selling out, and they are a light for all of us who dream of and work to build justice. We also respectfully address those who have been forced to seek in other lands what was stolen from them in their own geographies; those who migrate in search of life, as well as those who, without self-interest and in their own ways, times, and means, support those migrants. Today, with complete disregard for our rights as originary peoples, the bad governments claim to consult the Mexican people as to whether they prefer the airport be built at the Texcoco Lake site or in Santa Lucía, but we know that both, through their so-called aerotropolis[i], imply environmental devastation, dispossession of adjacent territories and the commodification of community life. Both options further turn our country into the necessary link for the free flow of transnational capital, facilitating the entry and exit of commodities and the exploitation of everything we have for the benefit of the few. Both options are aimed at setting us more firmly on the path of death that today threatens all of humanity. Both more firmly entrench neoliberal capitalism as our people’s executioner. The government should not be asking us where to put the new airport. In the face of the millions of people suffering displacement, poverty and repression; the thousands forced to migrate because of the destruction wrought across the world; and our mother earth who can no longer withstand the disease imposed on her by capitalism, had they any shame at all, the question would be whether or not we agree to continue down this path that is leading us all toward death, war, and extermination. We know they won’t ask that question, though, because their path is mandated by the powerful who actually rule over them. The NAIM is not the only missing piece in their plan to disfigure the country and shape the tragedy that is only just beginning. Thus our word and our call is to continue to organize ourselves in resistance and rebellion, which is our struggle for life. We originary peoples cannot vote in favor of our own extermination. As much as the bad government might pretend to carry out a referendum (committing fraud, buying votes and deceiving the people of Mexico), this attack on freedom and on the territories that sustain life will not be carried out in our name. The CNI-CIG and the EZLN reiterate our unequivocal rejection of the construction of the New Airport of Mexico City whether it be built at Texcoco Lake or anywhere else. This project will strengthen big capital and benefit a few tycoons like Carlos Slim, Carlos Hank Rhon, Bernardo Quintana, and Hipólito Gerard Rivero (Carlos Salinas de Gortari’s brother-in-law), or whatever name the capitalist hydra takes on; all of their wealth is based on the suffering and exploitation of millions of us below. This project, like all the other mega-projects imposed in our geographies, is aimed at wresting from us what is ours, at the cost of the life of whoever resists. We recognize, respect, and salute the struggle of all those who, in carrying out their autonomy, decide to participate or not in the so-called referendum on the NAIM, and we call on everyone to unite efforts, to grow and strengthen our unity across our diversity from below in order to stop the destruction of our originary, campesino, and urban territories. These so-called “mega-projects” are nothing but another element of the system’s war against everything, sowing violence, destruction, and death all over the world and forcing populations to migrate in search of the life that was denied them in their places of origin. This is the situation of those who today migrate from their Central American territories, who are being attacked, harassed, and slandered on orders from the big boss in an attempt to feed hatred toward difference and extract even more profits from the tragedy he has provoked. The system pursues today what it provoked yesterday. Our own tomorrow hovers in the painful steps of these “migrants” if we do not organize ourselves in defense of life. We have long supported, respected, and maintained solidarity for these sisters and brothers and will continue to do so, however limited our capacities. Now as before, we will share with these migrants the little that we have in our communities, homes, paths, and territories, and they can count on our encouraging word and dignified rage to ease their path and help them to carry on. Because the world is not the property of any flag. It belongs to all of us [todas, todos, todoas] who make it turn with our labor, who make it flourish by sowing life where the system harvests death, and who, like the families of those absent from Ayotzinapa, walk the world in search of truth and justice—that is, in search of life.